As you might know, I am a fan of the artistic work of fellow blogger Joel DeJong. His art is not only found on this blog (header) but also on walls of many homes, errr... man caves, such as mine. 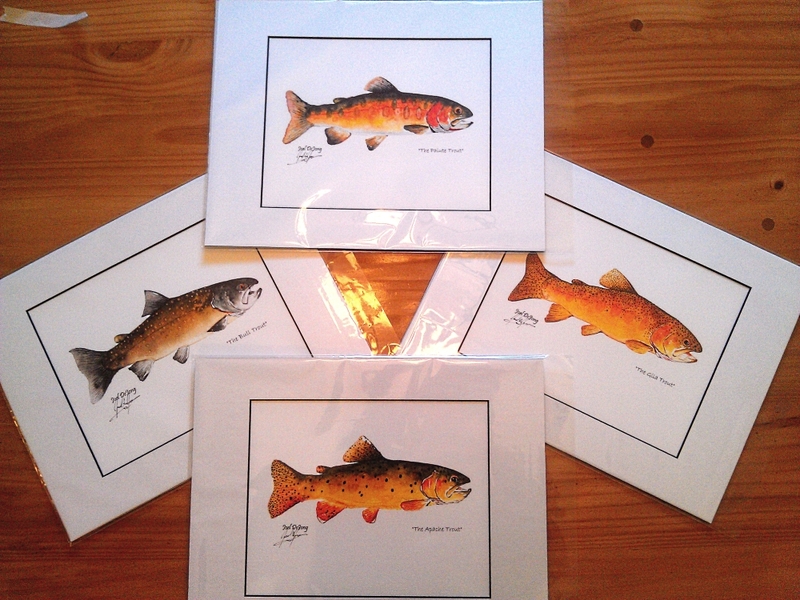 Joel is launching a great Christmas Deal, offering four awesome trout prints at an unbeatable $65. They look great as is, but if you are willing to frame them like I did for the ones I own, they will make a great addition to any fisherman's home. Disclaimer: I am not getting compensated for this pitch and do it only because I love Joel's art. I will though entered into a contest to win a free print. After seeing a few of my fellow bloggers showing off their new tenkara rod wall racks (well, actually they are billards cue wall racks) I had to get one as well. After I hung the newly framed picture of Joel DeJong of A Year on the Fly, I thought I might as well hang the rack. I have to say, I dig both both a lot! The rack was less than $10 in the sports section at my local Wal Mart. Who would have thought that 10 bucks can look so cool. Let's hope I won't get any more rods! Thanks to Mike at Troutrageous! and Jason at TenkaraTalk for the inspiration! What on your wall of your man cave?